Is it the right time to BUY Information Technology Stocks? The IT stocks are falling dominoes. The front line stocks are seen just devoid of any energy to move north! Does this gives a good opportunity to Long – Medium term traders to get into the IT stocks. The IT stocks are offering buy – backs! Do we think, that promoters are going to buy back, because the future of the sector is gloomy or shady? Well we are not going to dive into fundamentals, keeping things short, lets have a look at all the major IT companies on NSE – Nifty. 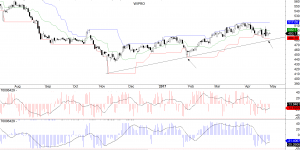 The stock has recently announced buy – back, the stock is trading near a supporting trendline. One bullish gesture on the line will be a deceleration by the counter, that it is no more bearish. If we give a look at the volume pattern (chart not attached), there is a decrease in negative volumes. This also indicates that bears are losing grip on the stock. A triple bottom formation, the bodies of the candles is shrinking. The stock is hovering around a very good support zone. The momentum indicators are picking up. Gives a good indication that bears are losing steam, and sooner the bulls will be in throttle. Trading near a long term support zone. The price and volume relation are gelling in. The down days are powerless, with no volumes, as we are nearing the support zone the bear candles are shrinking. Well the chart has a story to tell! Yet another stock that is trading near the support trendline. While others are yet to display strength, HCL has already given some hint of north bound journey. The candle formed on 26th April, seems an exhaustion candle, bulls are slowly making their way in the counter. Trendline support is seen and volumes are peping up on bull candles. The sellers last sold on the exhaustion candle on 26th April. Poised to move up. Well fun apart the IT stocks are very well poised to move up. The mid caps IT stocks have already started to move. Also the buy-back offers raining in this sector, hints that IT may be the leader in coming months!